SBI PO 2018 Preliminary Examination will happen on 1st, 2nd and 8th of July, 2018 and we have a handful number of days for our preparations. Attending mock tests is one way to increase your ways to score in the SBI PO preliminary Examination 2018. If you are preparing for the SBI PO Exam 2018 , then you should read more about it now. This SBI PO Exam 2018 preliminary examination is happening immediately after the SBI Clerk Preliminary Examination 2018. So these two exams SBI PO Preliminary Examination 2018 and SBI CLERK Preliminary examination 2018 gains the much needed importance as the questions asked and also the difficulty level of the Questions will be followed in the forthcoming exams. The total number of Vacancies available for the SBI PO Exam 2018 are provided as below. 3 IMPORTANT REASONS WHY YOU SHOULD TAKE SBI PO 2018 PRELIMS MOCK TESTS ? The whooping number of vacancies is a factor which pushes the aspirants to apply for the exams. According to the reports recently released by the major medias almost 9 Lakhs applicants have applied for the SBI PO Exam 2018. So if you need to stand out from the crowd of 9 Lakh applicants then your preparation level should be higher than the others. 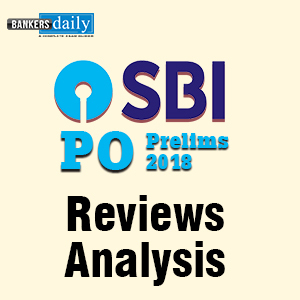 Here we provide 5 important reasons to attend SBI PO Prelims MOCK TEST 2018 , so read further and get enlightened. 1. Researchers suggest that 75% of the aspirants / students consider themselves procrastinators. Some quotes it this way, “the further away an event is, the less impact it has on people’s decisions.” So making changes in the regular events like regular preparations is the key to crack the exam. So this will help you to crack the SBI PO Prelims Exam 2018. 2. On checking the previous year cutoff marks and also considering the number of vacancies , this exam garners many applications and this is evident from the fact that 9 lakhs registration were made for the SBI PO Exam 2018. Since the previous year cutoff marks of SBI PO Prelims Exam 2017 is high and we can expect the same for the SBI PO Exam 2018 too. 3. This Exam pattern was also the same in the last year. Practicing is the key to crack the exam. So attend as many exams as you can. This will prove beneficial as the hard work and preparations, you put in for the exams will give the expected results. Last time, we have updated the MOCK TESTS for the SBI CLERK Prelims Exam 2018 and since many of the aspirants were thronging us with requests for the SBI PO Preliminary Exam 2018. We are here providing 49 MOCK TEST SERIES for the SBI PO Preliminary Exam 2018. As usual the price for the Exams are less as this will be beneficial for the aspirants. Aspirants can BUY the 49 SBI PO 2018 Prelims MOCK TEST series from the link that is provided below or from the Store of Bankersdaily. The offer is valid till 5th June, 2018. 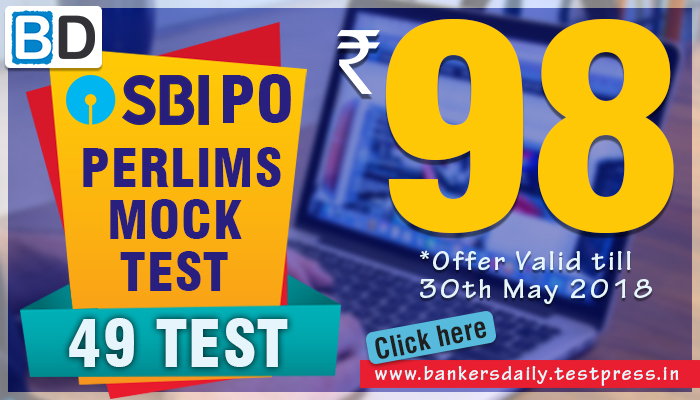 The price for the 49 MOCK TEST SBI PO – Prelims Exam 2018 is Rs.98/-. 49 test SBI PO online mock test series .